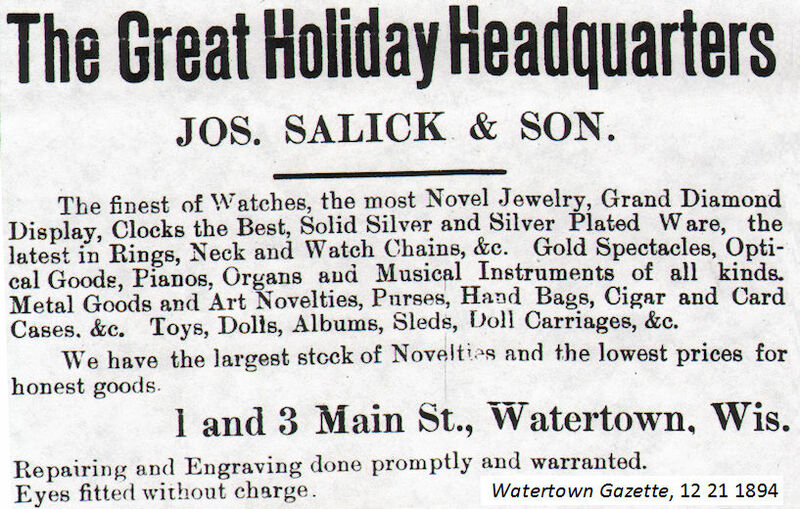 The present Salick Jewelry Co. was founded in 1853 by Joseph Salick who came to Watertown from Cincinnati at a time when Watertown expansion was at its height. 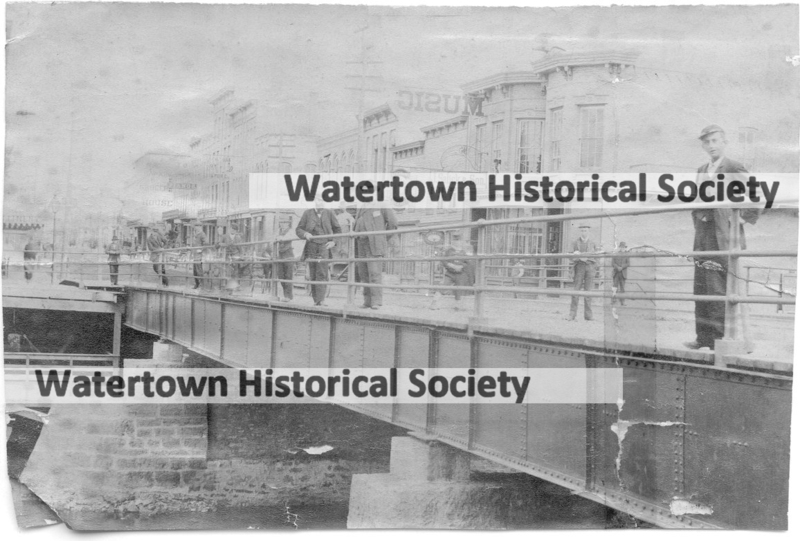 On March 3, 1853, the city of Watertown was incorporated. During the same month the city was authorized by the legislature to aid in the construction of the Milwaukee and Watertown, and the Watertown and Berlin railroads. On the first of August of the same year the city delivered to the railroad company bonds aggregating $80,000 at eight percent. Figures for the population of Watertown in 1853 vary from three to four thousand. There were many business houses here at the time, however, including six dry goods stores, eleven grocery stores, two drug stores, fifteen taverns, two bakeries, three meat markets, two book stores, six cabinet shops, four tinshops, few factories, two printing offices, six school houses, two select schools, and many churches and one bank. The census of 1855 shows the population to have been 8,512, an increase of 7,000 in ten years. In point of population Watertown was the second city in Wisconsin. 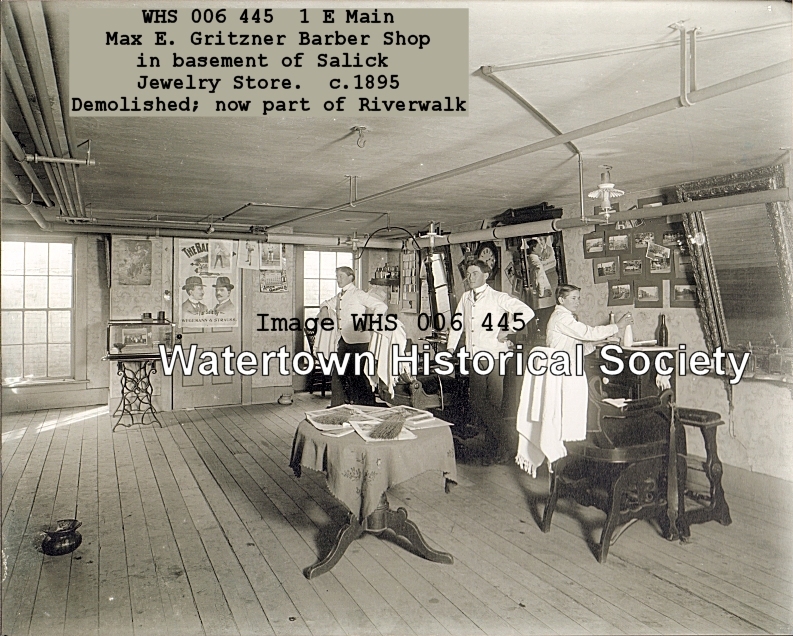 At this time Mr. Salick established his first store in Watertown. It was located on the site of the present New York meat market 8 Main Street (1930 City Dir). The year following he erected the building on the site of the present store building. Later, when his son, Charles J. Salick, was old enough to enter the business, his father took him into partnership and with the gradual and steady expansion of the business it was found necessary to build an addition to the store which is now the building occupied by the company at 1 and 3 Main Street, next to the bridge. Note Salick-built timepiece (now at Octagon House) in window behind Joseph. Jos. Salick & Son have on exhibition two of the renowned Rohlfing upright pianos. All interested in music are kindly invited to inspect these powerful, sweet-toned and durable instruments. Never before has there been such inducements offered on first-class instruments as Salicks are giving on these for a short time. Notice is hereby given that the co-partnership heretofore existing under the firm name of Jos. Salick & Son, dealer In musical Instruments and novelty goods, has this day been dissolved by mutual consent, Mr. Jos. Salick retiring from the business. Hereafter the business will be conducted by Chas. J. Salick. All accounts against the old firm will be settled by Chas. J. Salick, and accounts due the firm collected by him. The jewelry business heretofore conducted by Jos. Salick will hereafter be carried on by said Chas. J. Salick. All accounts against said firm will be settled by Chas. J. Salick, and accounts due the firm collected by him. Thanking our patrons for the past, we solicitude to their patronage for the future. Jos. Salick, although retiring, will have charge of the repair work and give it his strict attention, satisfaction guaranteed every time. Upon the elder Salick’s retirement his son, Charles J. Salick, assumed control and has since formed a partnership with his son, John E. Salick, and the firm is now known as Salick Jewelry Co. 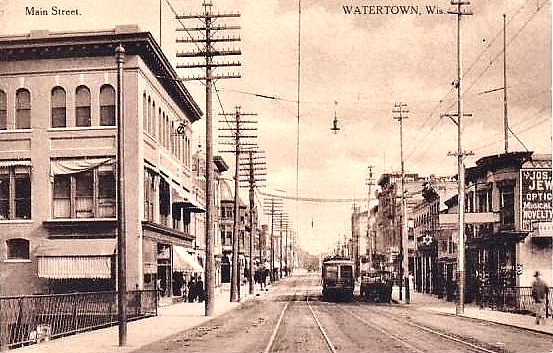 It would be impossible to describe the hardships and handicaps in the early history of the Watertown store. One change that has taken place in the business conditions since that time and the present day is plainly indicated by the fact that working hours were from 7 a.m. to 9 p.m. daily. Oil lamps supplied light by which the watchmaker busied himself. There are several clocks in the store which were made by the founder of the store and every part was made out of material obtained in Watertown and which have given accurate service all these years. The anniversary about to be observed may well be regarded as most important because it finds the Salick Jewelry Co. thoroughly seasoned and tempered by the past traditions of achievement and ambition and with much to cause one to believe that the coming years will continue to be happy and prosperous. The company plans “open house” for the week of June 3, and during this time they have arranged for many interesting displays of the jeweler’s art and craftsmanship. One of the items of interest on display is a watch over 200 years old of the English verge type which still keeps accurate time. The firm will be pleased to have the people of Watertown and vicinity call and see these displays. Unlike a person, a jewelry business upon entering its seventy-fifth year cannot be called old. From time immemorial the jeweler has supplied to every home those gifts which outlive the generation in which they are purchased. Once these things have become the possession of the buyer they assume that priceless consideration known as sentimental value. The heirloom of today seems but the purchase of yesterday. Precious stones, gold and sterling silver have been a standard of value for centuries. They have always gone hand in hand with confidence, confidence in the merchants who sponsor it. Today, in spite of changed methods of merchandising, the same confidence marks every sale of jewelry. And so, after seventy-five years, Salick’s store marks the time during which the public has expressed its confidence in them to correctly interpret their continuous demand for the artistic. Joseph Salick was the first to commend electrical lights and signed a contract for a substantial number of lights. Most of the business men were indifferent but became convinced of its feasibility as soon as a few were put in use. 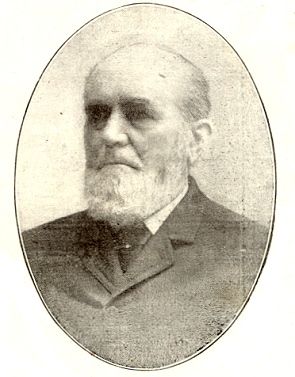 The Joseph Salick was one of the three first church council or trustee members of St. Henry’s Parish of Watertown, assisting Father Conrad Beck, the first residing priest. Born in Westphalia, Germany in 1824, Joseph Salick served in the German army during the revolutionary period of 1848. 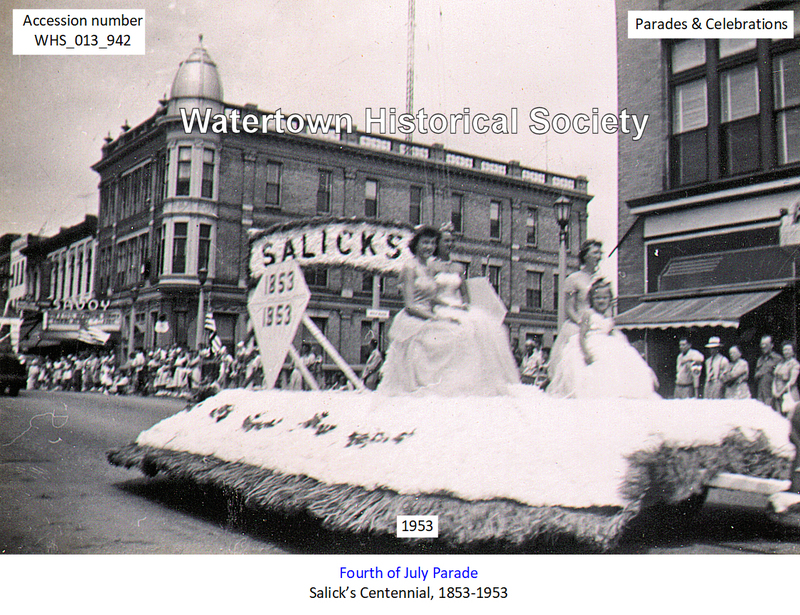 In the year 1853 Salick moved to Watertown. One of his ten children, August, became a priest for the Archdiocese of Milwaukee. Salick was a prominent resident, devoted member of the parish and was a pioneer jeweler and senior member of the firm of Joseph Salick & Son. Salick opened the first jewelry store in the community in 1853 and always lived in the vicinity of the church; for a time his home was at 802 N. Fourth Street, one of the most beautiful homes in the city, originally built by John W. Cole. He worked at the jeweler’s bench up to his retirement at age 85, being at the time the oldest jeweler in Wisconsin. 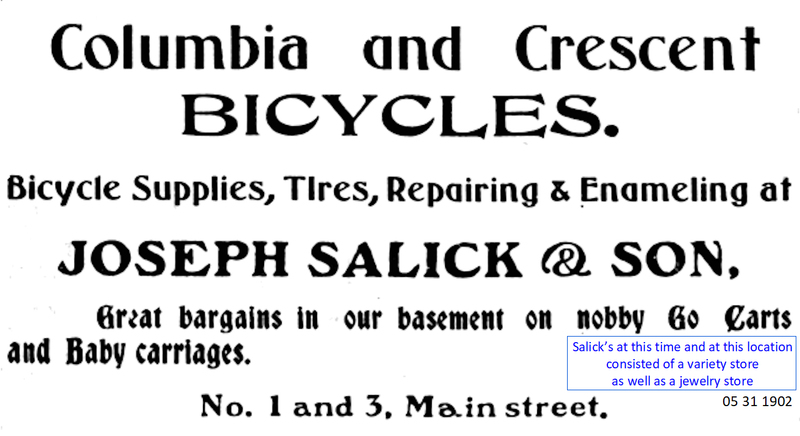 The Salick Jewelry Company, 217 Main Street, this city, is celebrating its one hundredth year as a jewelry concern. Believed to be the oldest jewelry store in the state, it has been in continuous operation by the Salick family since its founding in 1953. Joseph Salick, the founder, came to this country from Germany in 1851. He traveled by wagon team through the woods from Milwaukee to Watertown in 1853 and started his jewelry business. The first location was at the present site of the Wisconsin National Bank [104 W Main]. 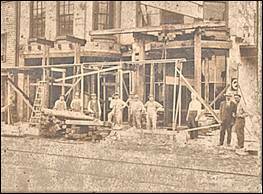 A year later the business moved to the present location of the New York Market [8 E Main] and later a new store was built at No. 1 and 3 [E] Main Street. This remained the location of the Salick Jewelry Store for many years. A downtown business with a colorful history will end with the closing of Salick Jewelers, a Watertown landmark for over 140 years. Rowland and Terry Straka, who have owned and operated the jewelry business on the corner of East Main and South Third streets for the past seven years, are in the process of liquidating the inventory in celebration of Rowland's retirement at age 65. 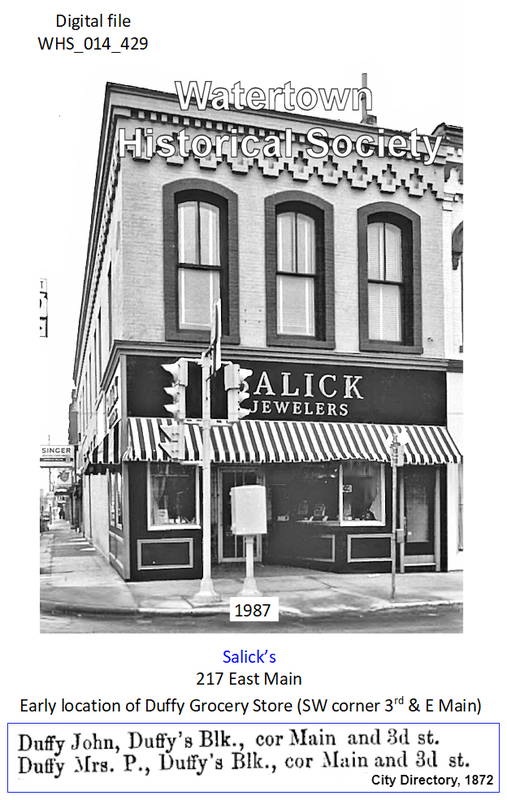 Salick Jewelers is believed to be the oldest jewelry store in Wisconsin. The business was founded in 1853 by Joseph Salick, who had been a clock maker in Westphalia, Germany. 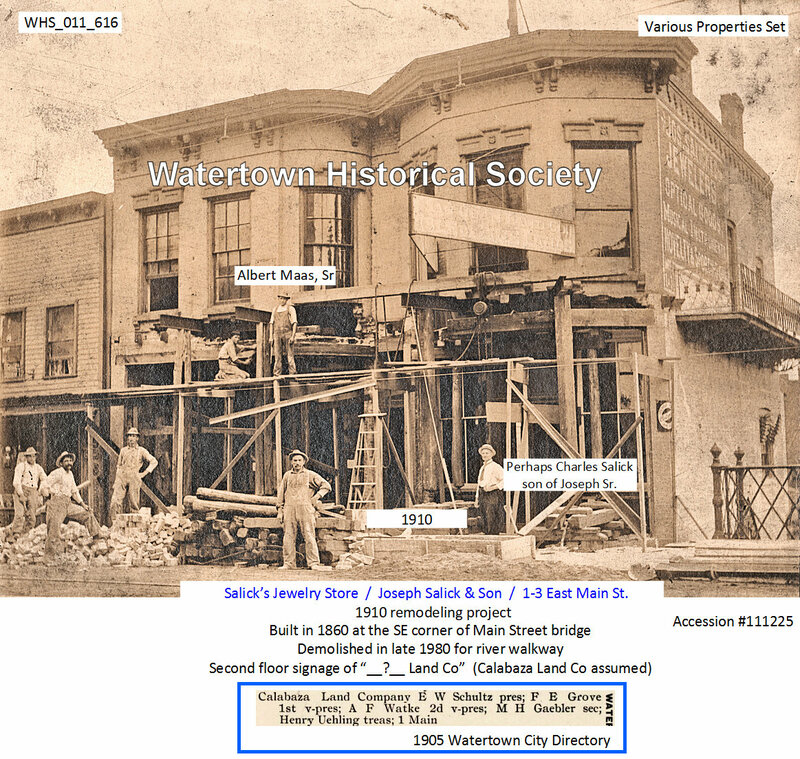 It was one of Watertown's earliest retail businesses, starting just 17 years after the city's first white settler, Timothy Johnson, arrived here. Over the years the business has sold a countless number of diamond and wedding ring sets to generations of customers, and also played a part in the evolution of the men's pocket watch to the now traditional wristwatches for both men and women. Upon resolution of Alderman Mayer, the mayor appointed the following committee to investigate the merits of an electric fire alarm invented by Joseph A. Salick, H. C. Mayer C. Mulberger, J. F. Prentiss, R. H. Radtke, H. C. Fredrich. Calabaza signage noted in photo. At high noon Wednesday, July 28, 1909, a wedding of more than usual interest took place at the home of Charles J. Salick and wife, Third Street, the contracting parties being Miss Letitia Marie Salick and Assistant Postmaster Sidney Frederick Eberle. The ceremony was performed by Rev. Father Hennessey, pastor of St. Bernard’s Church. For several days the house had been in the hands of the members of a club to which Miss Salick belonged and by the time appointed for the wedding it had been transferred into a bower of beauty. The parlor given up to the ceremony was done in white and green, the dining room in sweet peas and smilax. To add to the beauty of the scene the shades were drawn and the house lighted by many candles. Promptly at high noon Miss Leona Brandt struck up the chords of Mendelssohn’s wedding march. The ribbon bearers, Miss Elsa Schempf and Miss Margaret Eberle, in gowns of pink and white, stretched the ribbons for the bridal party. Miss Ida McGough of Milwaukee, attired in white French organdie and pink silk, was maid of honor, and she carried a large bouquet of pink sweet peas. Following came the bride on the arm of her father. She was gowned in white messaline trimmed with duchess lace and embroidered net and wore the conventional veil. She carried a shower bouquet of white sweet peas. The best man was Ralph Eberle, brother of the groom. The ceremony was followed by a breakfast of ten courses, covers being laid for 18. The servers were the Misses Della Koenig, Selma and Della Hoermann, Elsa Baumann and Elvira Emmerling. After a tour of several weeks in Michigan the groom and his bride will make their home at 317 North Montgomery Street, this city, and will be at home to their friends after October 1st. The groom and his bride are two of Watertown’s most esteemed citizens and have passed all their lives in our city, with the exception of a short time the groom was employed in the west. 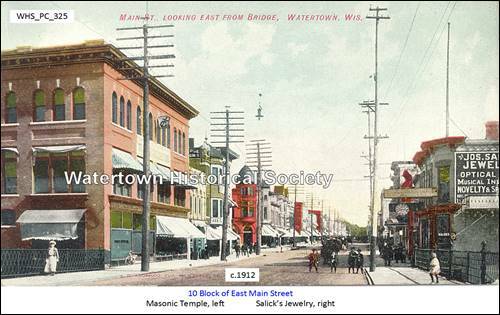 They are members of two of Watertown’s oldest and best families, the groom being a son of Postmaster H. T. Eberle and wife, and the bride the eldest daughter of Charles J. Salick and wife. Their friends are all who know them and they are known to nearly everybody in Watertown, hence on entering married life they have the hearty good wishes of all our people for a long, prosperous and happy life. The Gazette joins their numerous friends in wishing that their fondest hopes of matrimonial bliss will be fully realized. 06 10 After a lingering illness of several months Joseph A. Salick died at his home at 208 West Main Street [?] on Tuesday, June 7, 1910. 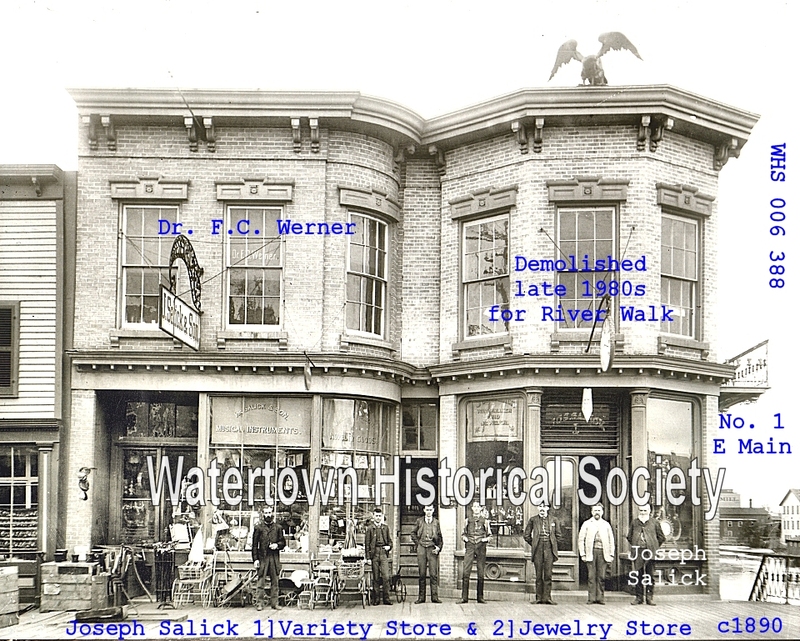 Deceased was a son of Joseph Salick, a pioneer jeweler of Watertown, and was born in this city on April 26, 1855. He was educated in the schools of this city and after leaving school learned the jewelry trade in his father's store. November 5, 1879, he was married to Miss Addie Cody, daughter of the late Dr. James Cody, and shortly after he engaged in the jewelry and music business at Appleton, having at one time one of the largest stores in his line in the state. About 20 years ago he closed out his business at Appleton and removed to this city and engaged in the optical and jewelry business, which he conducted up to a short time before he died. Mr. Salick was a genius in many ways, especially in the mechanical and literary line. A few years ago he published a work entitled "Telepah," a dramatic poem of the Orient, foretelling the wonders of the electrical world. It was published in four volumes and had a large sale. Undated image appears to match remodeling noted in above 1910 article. History of Milwaukee, City and County, Volume 2, William George Bruce, S. J. Clarke Publishing Co, Chicago, 1922. Otto T. Salick engaged in the real estate and insurance business and widely known as the president of the North Avenue Advancement Association was born in Watertown, Wisconsin, April 10, 1877, a son of Joseph and Elizabeth Hepp Salick, both of whom were natives of Germany, whence they came to the United States in youth. They cast in their lot with the pioneer settlers of Milwaukee where the father first engaged in business as a watchmaker and jeweler. He afterward removed to Watertown, Wisconsin, and there conducted a jewelry business to the time of his death. Both he and his wife have passed away. Otto T. Salick was educated in the public and parochial schools of Watertown and also attended Marquette University of Milwaukee. When his school days were over he started out in the business world and was employed in various capacities. Later he engaged in the real estate business and has built up an extensive trade in this connection at No 3610 North Avenue. His residence in Milwaukee dates from 1895 and through the intervening period he has steadily forged to the front in business circles in this city. He has negotiated many important realty transfers and through his activity has contributed in considerable measure to the improvement and progress of the northern section. He also has a well organized insurance department and was one of the founders of the North Avenue Advancement Association which was formed in March 1919 and has steadily grown having on its list of members the leading business and professional men of this section of the city. Mr. Salick has taken a most deep and helpful interest in the movement and the purposes underlying the society and recently contributed to the North Avenue Star a most interesting article setting forth the history of North Avenue and the development of this section of the city. In 1902 Mr. Salick was married to Miss Mary Reiter of Milwaukee and they have become the parents of eight children; Olive fifteen years of age, Florence aged thirteen, Frances eleven, Dorothy nine, John seven, Genevieve four, Ralph three, and Robert two. Through the field of political activity Mr. Salick has also done much for Milwaukee's benefit and progress. In 1903 he was appointed assessor of the twenty second ward holding the office until 1912 or for a period of nine years. During this time he was also a member of the board of review. Any project or plan put forward for the benefit and upbuilding of the city receives his endorsement and loyal and active support. Samuel John Luchsinger, 1922 - 2013. He and his wife, Margaret, owned the Salick Jewelry Store, located at 217 Main St. in Watertown, for 42 years, and sold the business in 1988, currently Bradow Jewelers. 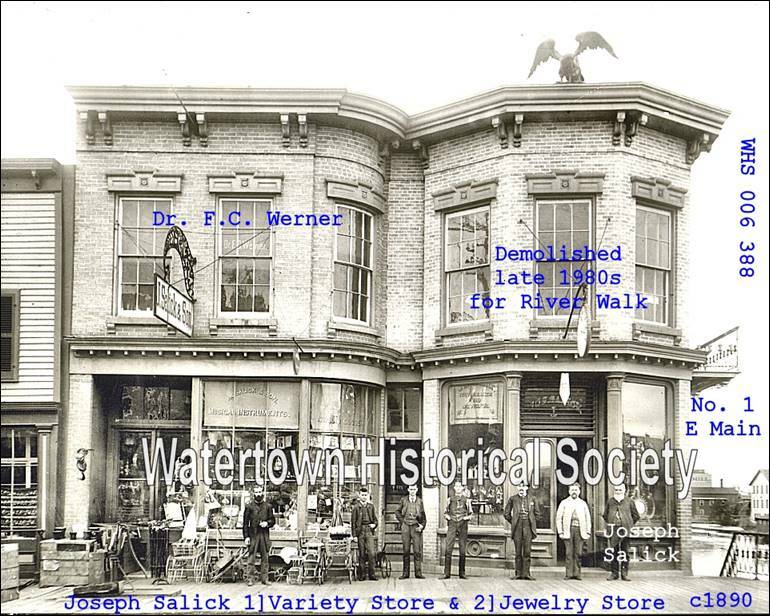 Salick Jewelers was founded in Watertown in 1853. Mr. Luchsinger was highly respected in the Watertown business community for his integrity, sincerity and friendliness to customers and colleagues. Mr. Luchsinger was trained in gemology and a respected member of the American Gem Society. Joseph Salick used to row his boat down the Rock River every morning to near his Main Street store. Construction of Salick Jewelry Store, 1-3 E Main, photo: Faces & Places - Watertown Area, Heritage House Publishing (Marceline, MO), 1999, p 40. Charles Salick and John Salick had compiled early weather reports on the city.